This is a 2-part article series. This second part covers what has been announced for iOS 6. 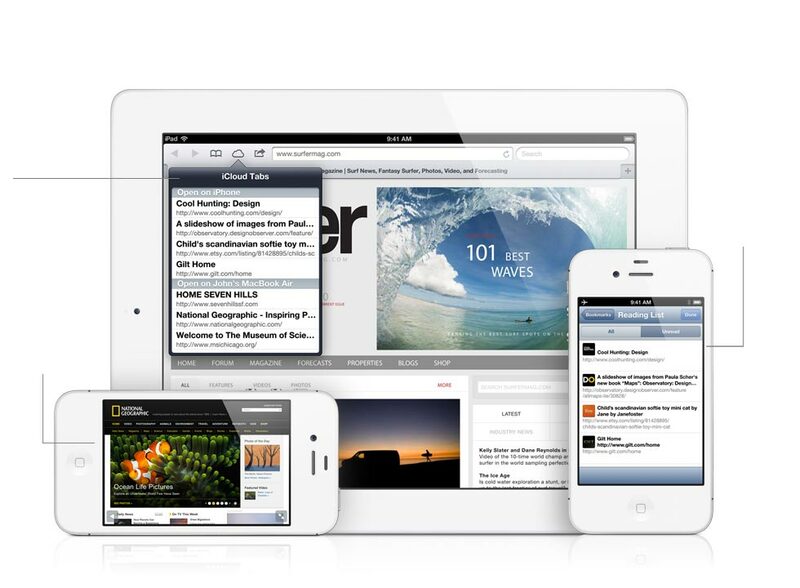 At their World Wide Developer Conference today, Apple announced iOS 6 with 200 new features. A beta version is available today for registered developers and will available to consumers in the fall. Below I’ll do a brief rundown of the new features. The Maps app has been updated with a new icon. It seems the leak we saw last week was correct. As far as we know the app itself is completely new. It seems as if Apple has built something totally new, and Apple dropped Google as the Maps provider, using a proprietary service using the maps technology and talent they acquired previous to WWDC. They are also utilizing Tom Tom and Waze for turn-by-turn directions. 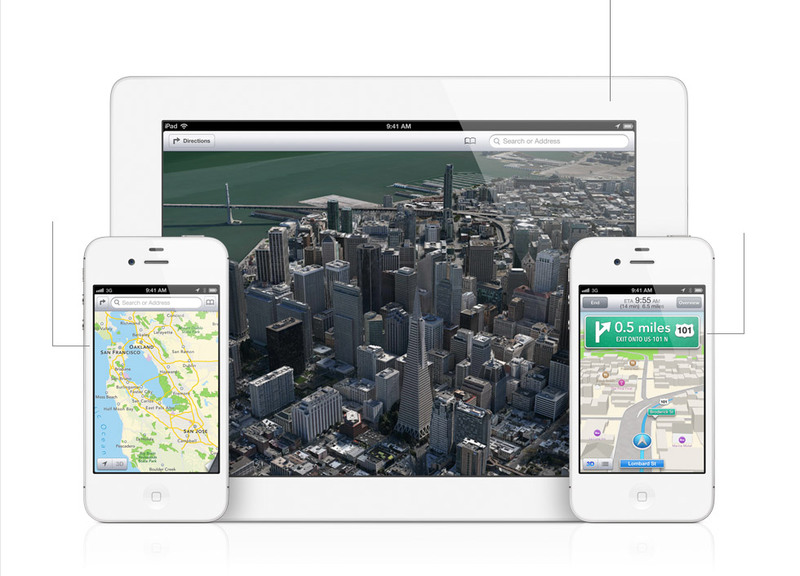 Apple’s preview of Maps’ Flyover and Turn by turn directions. impressive; this is the next generation of that. Flyover looks phenomenal (at least in screenshots we’ve seen) and includes the polish which has become almost a feature in Apple products in itself. You will also be able to zoom in very close on businesses and streets, and the maps app will show restaurant reviews from Yelp on any zoomed-in restaurant. One sad note, not every iOS 6 device will be getting all of these great features. Specifically, turn by turn directions and Flyover will only be available on the iPhone 4S and on the iPad 2 and later. This means that the original iPad, all the iPod Touches, and all iPhone earlier than the 4S will not get these features. Turn-by-turn directions seems like a feature that should be added to the iPhone 4 at least, if not all of iOS 6. Why they aren’t spreading this farther is unclear. Apple demoed a few new Siri features in iOS 6, but those added features were some of the most heavily demanded from users. Siri can now give you a variety of sports stats covering basketball, soccer, football, baseball, and more. You can get the latest scores and stats of teams, individual players, and even odd bits of sports trivia. Siri pulling up sports scores and statistics. pre-order movie tickets through a service like Fandango however. Siri will also be expanding the languages it understands to include Mandarin, Cantonese, Korean, Swiss-French, Swiss-German, and more. This is great because you will now be able to update your Facebook status and tweet directly from Siri. A feature long wished for has finally been added. But the biggest addition to Siri is the ability to launch apps. Just tell Siri to launch Angry Birds, and you’ll be playing Angry Birds in no time. This is great for those with a lot of apps scattered about on their device. Apple also is bringing about a feature called “Eyes Free”. It is a feature that will be integrated with cars to allow you to control your iPhone through Siri. The screen will be shut off while connected to the car, and Siri will announce whatever news is coming your way, text messages, who is calling, and directions to your next location. I think that this is a great safety feature and I’m glad to see Apple adding this. Currently, BMW, Toyota, Honda, General Motors, Land Rover, Mercedes-Benz, Jaguar, and Chrysler are on board with this according to Apple. 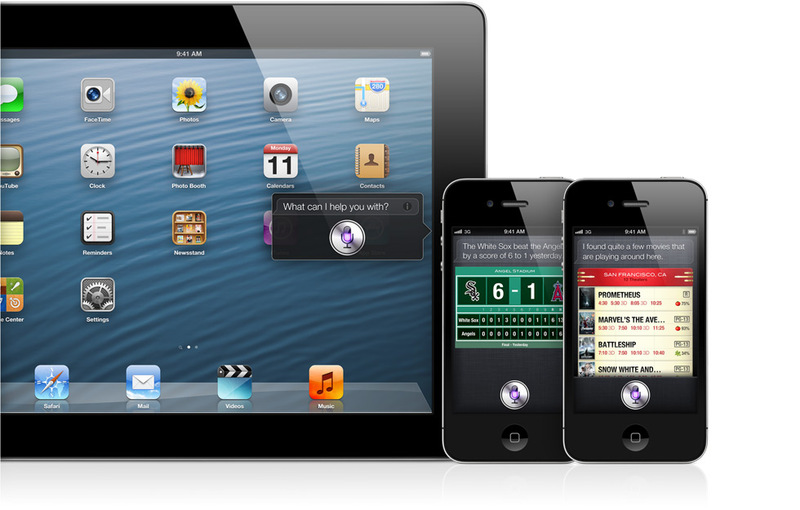 Oh, and Siri will be able to run on the iPhone 4S and the new iPad (third generation). Apple has really embraced some of the ways people are using the iPad. This has been especially true for those with some form of disabilities and how they use the iPad. Guided Access is a new app from Apple that allows users to control access to certain areas of an app. A controller user, such as a teacher, can turn on Guided Access and prevent access to the Home Button and limit touch and motion controls on the iPad. They will also be able to circle areas of an app on-screen. Whatever is circled will not be accessible to other users of the iPad. This means that a teacher could prevent a child from accessing settings or accidentally exiting the app. Apple talked a lot about autistic children when showing off this feature, and this really does target them and allow parents and care workers to help these people. Apple is updating its communication apps with several nice new features. iOS’s Mail app has finally added a flagging feature, allowing you to flag important messages. I use this feature a lot on the desktop to help me keep up with important emails that need responses or that remind me of things I need to take care of us. You can now setup a VIP Mailbox in iOS Mail, allowing you to only focus on emails from certain groups, companies, and people. This makes it easier to sort through email and get work done without having to constantly flag emails from certain people. Apple has updated how you decline a phone call. When you decline a call now, you get the added option of set your iPhone to remind you about the call at a later time or to send a quick text or iMessage to the caller. These messages can be manually typed out or you can use a premade message. And while we’re talking about calling, Facetime can now be used over WiFi and 3G connections, a feature that has been on Android phone and other video chatting services for a long time. Apple also has included a “Do Not Disturb” feature. You can set your iDevice to not notify you of any emails, Twitter updates, or any other notifications during a set time period. This was demoed as a feature for getting through the night with a good rest. Apple also said, however, that you will be able to set certain contacts that will be able get through this barrier, meaning you won’t ever miss a phone call or message from your child, boss, loved one, etc. There’s one more note though about all of this. Facetime and iMessage all work through your Apple ID, which has caused problems if a person didn’t have your Apple ID,and instead only had your iPhone’s number. Problems included messages and calls not syncing across devices, or certain messages showing up only on your iPhone. Now, Apple is integrating your iPhone’s number with your Apple ID, meaning your Facetime calls and iMessages will always be synced across iPhone, Macs, and other iDevices. your web articles, now it saves the website for offline reading. And Safari can go into a special full screen mode when your iPhone or iPod Touch is held horizontally, letting you save precious screen real estate. Last year, Apple integrated Twitter with iOS, allowing you to tweet almost anything from anywhere. This year, Facebook integration is coming to iOS 6. You can update your status, share links, and show off your photos without launching the Facebook app. Likewise, your Facebook events and friends’ birthdays can be integrated with your Calendar, and your contacts personal information can also be added directly. If this integration is like Twitter, you will have to have the Facebook app already installed on your iOS device. Photo Stream is adding the ability to share Photo Streams with others. Just select the photos from your Photos app and anyone running iOS 6 or Mountain Lion will have that picture in their Photo Stream or iPhoto app. I see potentially a lot of great family albums and a few embarrassing moments being shared. And Apple has said that if you want to share these with people who aren’t using Apple devices, they will be able to see them on the web. Passbook was an interesting feature announced by Apple. Since Google Wallet was announced, people had been speculating about whether or not Apple would release a similar product, dubbed iWallet. While Apple didn’t announce anything with that, they did show off Passbook. Basically, you can store your coupons, loyalty cards, passports, movie tickets, and more in the app. Then you can use it to scan these items in a checkout line, in an airport, etc. But the app does more than storage; it also updates when your flight terminal changes, your coupons expire, and help you locate your seat in a theatre, as well as checking the balance on your money cards. And using your iDevice’s location systems, the app will show the appropriate tickets or cards on the lock screen based off the time and your location. I must admit that I wasn’t impressed at first glance, but I can see this as being a very useful app, especially for travelers. That being said, there seems to be no indication that you can add your credit or debit cards to Passbook. Apple has also included a few minor improvements as well. Apple has already talking about integrating more Chinese services into iOS for its Chinese consumers. Chinese users have an increased library of character, Baidu support for web searching in Safari, and other social networking features. A look at Apple’s new design for their online store apps. Improvements to the iBookStore, iTunes Store, and the iOS App Store also have received some revamping. Each of these stores now remember your preview history of songs, books, and other media, allowing you to quickly re-find them for purchase later. You can start shopping on one iOS device and continue the purchase on another. Lastly, the stores had a little visual refresh to show the hottest content in a Cover Flow-like system. iOS 6 seems to be giving users a lot of features they’ve been asking for, though some of it seems like Apple is playing catch-up to other apps and operating systems. We’d like to hear what you are most excited about. Please leave a comment below or hit us up on Facebook, Twitter, and Google+. Thanks! This is a 2-part article series. This first part covers what has been announced for OS X and the Mac product lines. The new MacBook Airs have received a few notable upgrades. First, the Airs are all getting i5 Intel Ivy Bridge Chips, as well as the Turbo Boost feature. Each now come with 4 gigs of RAM upgradable to 8 gigs. Apple’s Macbook Airs. No noteable design changes. However, they can be upgraded to 512 Gigs of Solid State Memory on all but the lowest end 11-inch model. You can also upgrade all but the lowest end 11 inch model to an i7 Intel Ivy Bridge Chip, starting at 2.0 Ghz. All the Airs are also getting 2 USB 3.0 ports. Apple has finally seen fit to upgrade to USB 3.0, and each Air will have a 3.0 port on each side of the Mac. They still have the same Thunderbolt port, headphone jack, and power port. Lastly, they will have a 720p front facing Facetime camera. You can begin buying them today and will get Mountain Lion for free. The MacBook Pros also see a minor spec update as well as a removal. The 17 inch MacBook Pro has been silently discontinued, though you can still buy refurbished models from the Apple Store. The low-end 13-inch MBP will have a non-upgradeable 2.5 Ghz i5 Intel Ivy Bridge processor. All the other MBP will be getting i7 Ivy Bridge processors. All the chips will have Turbo Boost. The 13 inch MBP’s will also be getting the graphics upgraded to use Intel HD Graphics 4000 instead of the former 3000. The 15 inch model will be using NVidia GeForce GT 650M graphics cards. The lower end models have 4 gigs of RAM, but can be upgraded to 8 gigs, while the higher end models have 8 gigs installed already. You can upgrade all but the low-end 13-inch models to a Sold State hard drive and up to 512 gigs. All the MBP’s will be getting USB 3.0 and 720p Facetime cameras, just like the Airs. They also still have their CD/DVD drives. Like the Air, you can begin buying them today and will get Mountain Lion for free. Apple announced a brand new MacBook Pro, which they call the Next Generation MacBook Pro. It truly is the direction Apple is taking for the future. about as thick as the MacBook Air, but still has the squared design rather than the tapered design of the Air. Like the Air, it uses a Solid-State hard drive. The low-end model has a non-upgradable 256 gig drive, the upper end model comes 512 gigs of storage, but it can be upgraded to 768 gigs of space, over three-quarters of a terabyte. Both models also come with the NVidia GeForce 650M graphics cards, and i7 Ivy Bridge chips with Turbo Boost. Both models also come with 8 gigs of RAM by default, but can be upgraded to 16 gigs of RAM, making this a power horse. And both sport the 720p Facetime camera, an SD card slot, 2 USB 3.0 ports, 2 Thunderbolt ports and, for the first time, a HDMI port. Most of the body is taken up by battery, almost half of it because of the biggest news. 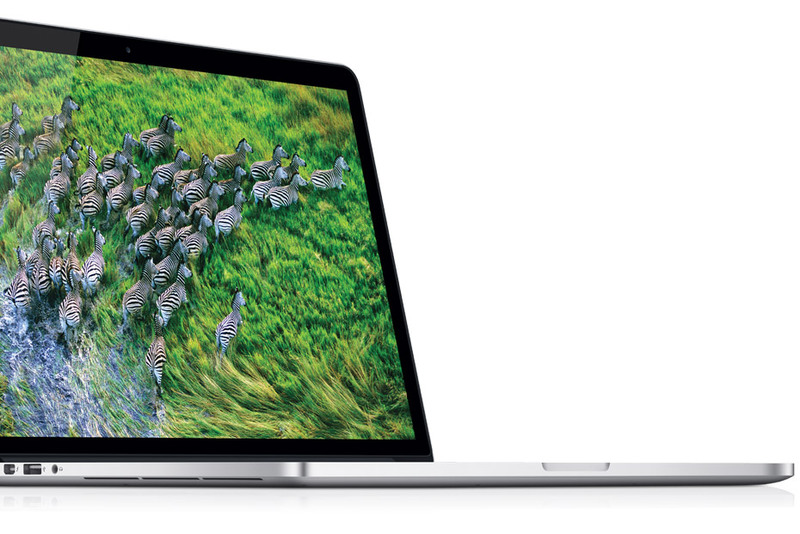 The Next-Gen MBP has a 2880 by 1800 Retina Display, which is double the resolution of the standard MBP or Airs. Between this high-definition display and the new graphics chip, the Next-Gen MBP’s screen look beautiful. Apple showed off some Diablo 3, as well their updated Pro apps like Final Cut and Aperture. It is available to order today. Apple talked a lot about Mountain Lion at WWDC. Apple showed a little of Notes and Reminders, two iOS apps making their way to OS X. Reminders and Notes sync with their counterparts on the iPad, iPhone, or iPod Touch so that you always have access to your notes and reminders. Reminders also integrates with iCal. Apple showed off Messages, allowing you to iMessage anyone in your contacts list from your Mac. It also means you don’t always don’t have to pull out your phone to answer an iMessage. Apple is always bringing in a unified notification system, just like they did with iOS 5. With a quick swipe to the right, you can see all of your active notifications such as Calendar appointments, new email, Reminders, App Store Updates, and more. Apps that integrate with Notifications will also pop up in a small box in the upper right hand corner, similar to how the app Growl works. Another cool feature is called Power Nap. Power Nap allows you to put your Mac to sleep and still allow it to fetch information. Your Mac will still be able to sync through iCloud, fetch your mail, and run Find My Mac, among other iCloud features. Your Mac will also be able to back up with Time Machine and run software updates. All of this will happen without your mac having to wake up, turn on the fan, and will use minimal battery. Hopefully other apps will implement this feature soon after release. It is also unclear whether updating means updates to OS X and/or Mac App Store apps. Apple also brought over Voice Dictation, using the same style technology as the iPad. It works in Japanese, English (U.S., U.K., and Australian), German, and French. They also have worked to make sharing information from everywhere a reality. Share Sheets, as Apple calls it, allows you to share text, pictures, websites and documents with a variety of services. Apps like Safari, as well as Finder, allows you to Tweet, email, message, and post to Facebook any of these items. 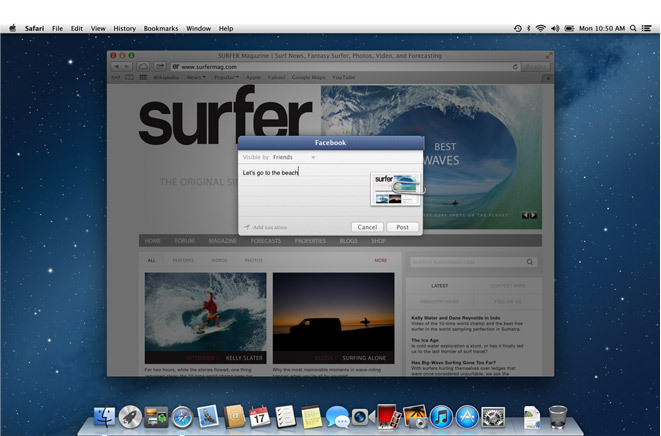 Facebook link sharing from Mountain Lion’s Share Sheet. This also shows that you can post to Facebook or just update your status directly from OS X, though this doesn’t mean you can check your wall or timeline from OS X. You will be able to comment on what your friends post and you will get Facebook notifications in Notification Center. 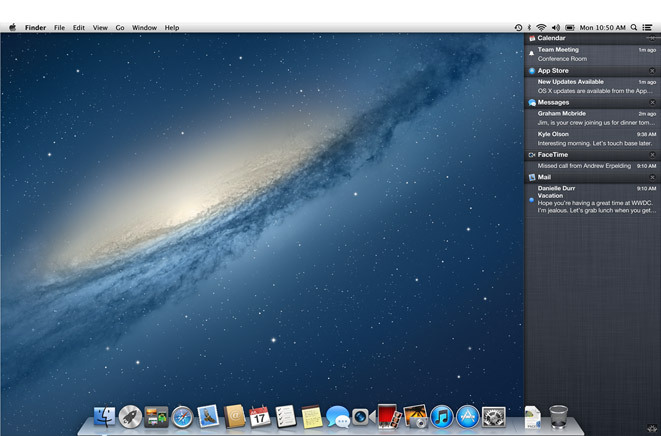 Mountain Lion also brings Game Center and AirPlay to the Mac. Game Center allows you to play games with anyone on a Mac, iPad, iPhone, or iPod Touch that supports Game Center. You can also track high scores, achievements, and more. This leads us into AirPlay; Mountain Lion allows you to mirror your Mac’s screen through an Apple TV, meaning you can beam your Mac’s display to a HDTV. You can browse the web, play games, and stream media all to a bigger screen. Apple also is allowing you to share a screen in Game Center with your friends through AirPlay. So if you’re playing a game on your Mac, and your friend wants to play the same game against you on their iPad, you can play split-screen through your Apple TV. Apple also showed off Safari. Safari now will have their search bar integrate with the address bar, allowing you to search from the unified bar. Safari also has updated the way tabs work. First, you can use a gesture to visually see and sort through all of your tabs. The style look very similar to the way it works on an iPhone and iPod Touch. Also, Safari now allows you to sync your open tabs through iCloud to any of your Macs or iDevices. Apple did not talk much about Gatekeeper in their discussion of Mountain Lion today. Gatekeeper is their service in Mountain Lion that allows you to limit where you can install apps from on your Mac. There probably wasn’t anything major enough to update and talk about, as the feature is pretty straight forward. A lot of the news about iCloud on the Mac focused specifically around the apps Apple was bringing from iOS to the Mac, as well as Safari. Two items were specifically highlighted though. First is Photo Stream. Apple is updating Photo Stream so that you can share and combine Photo Streams with other people and share them. You can select Photos from your Mac or iDevice and create a shared Photo Stream album. This could be useful for people wanting to share photos from a family event taken with their own iDevices. However, this functionality is not yet implemented and likely won’t be until the release of Mountain Lion and iOS 6. The second was Documents in the Cloud improvements. When Documents in the Cloud was originally debuted, people thought it would work like Dropbox in the sense that you could edit documents on one Apple device and then it would automatically sync to another. In reality, it only worked for iOS devices, not for Mac. Apple has come back and improved this functionality. Apple showed off Pages on Mountain Lion being able to pull and edit documents from your iCloud document library and edit them, then have them immediately upload back to iCloud when you’re done. They also said this functionality would be in Keynote and Numbers. This is exactly what iCloud has need, and hopefully it will work just as functioned when Mountain Lion and iOS 6 are released. Apple showed off a little of their updated Pro apps, specifically Aperture (their professional photo-editing software) and Final Cut X (their professional video-editing software). While new features weren’t really announced, Apple did say they were being updated to support the Retina Display of the Next-Gen MacBook Pro. This elicited a lot of excitement from several professional editors in the crowd. Any other major updates weren’t talked about while the Keynote was going on. Apple had a lot to talk about on stage and they were really excited to announce it. The biggest news from the Mac side of things has to be the Next-Gen MacBook Pro with the Retina Display, though improved iCloud integration, Facebook in OS X, notifications, and Power Nap also really stick out in my mind. Tell us what you think below about WWDC. What did you like, what did you dislike, and what do you wish Apple had talked about/shown off? Let us know below, or hit us up on Twitter, Facebook, and Google+. Thanks! A few months ago, I decided to make a site for iOS the same way I had for OS X. 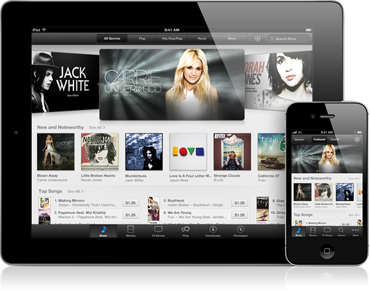 This meant reviews of apps and new iOS devices, as well as the latest news about the iPad, iPhone, and iPod Touch. This site kept getting pushed backed because of external issues. Along the way, I came to the conclusion (pretty obvious for anyone who has paid attention to Apple over the last couple of years), that it was nigh on impossible to write news for the Mac without somehow dealing with iOS. With the release of iCloud, Lion, and the upcoming Mountain Lion, this only proved the point. So today I am announcing two big updates to the EasyOSX world. First, iOS news and reviews will now be officially covered under EasyOSX along with all the Mac goodness you have come to know and love. Mac and iOS are becoming increasingly integrated in the Apple world, and our site is now evolving to reflect that. On Friday, June 1st, Apple officially began requiring all apps sold in the Mac App Store must be sandboxed. What does this mean, and how will it affect you and your apps? Sandboxing gets its name from kids playing in a sandbox. When a kid plays in a sandbox, the idea is that all of the play happens in the sandbox. The kids enter the sandbox to play and don’t leave the sandbox until they are done playing. No toys or sand enter or leave the sandbox. In reality the allusion has some flaws, but I think you get the idea. Apple has required that any apps sold in its Mac App Store do a very similar thing. A developer codes their app to create a sandbox when launched. This prevents the apps from accessing unnecessary resources, such as critical system files, documents, contact info, etc. This will prevent apps from unnecessarily grabbing private info, as well as potentially breaking the Mac OS. This should mean apps in the Mac App Store have a higher level of privacy and more security because of the limited access to the system. App makers will also be able to add entitlements if they need to access something out of the ordinary. This means apps that need to scan through system files to find something or access your webcam, have to have the entitlement written in and approved by Apple. For users, this only means added security. Users will not see much difference between how their apps worked before sandboxing was required and how they will work in the future. By limiting what an app can and cannot have access to, one app crashing will limit the potential damage to other apps running. Troubleshooting may also be easier. Things like caches and preference folders will be kept in “containers” only pertaining to a specific app, making it easier to clean these out should any trouble arise. There are some limitations to be noted however. Users may see a rise in the number of dialogue boxes asking for permission to access other apps because of sandboxing. Grant Cowie speaking to Macworld notes that many apps currently have the ability to send files directly into other apps. He uses the example of his own program “MoneyWorks” being able to send a spreadsheet to be directly opened in Microsoft Excel or iWork’s Numbers. Now, users will have to close MoneyWorks and then manually open the file in Numbers or Excel. Image editing programs will likely feel the same crunch. Some people have already reported bugs in apps like Apple’s Preview, which has already been sandboxed, that prevent it from sending a PDF straight to Mail or print. Many of these bugs will be phased out in the next couple of months. Some developers have taken to selling the “full versions” of apps on their websites, or allow users to upgrade from within the app to add these features. ClamXAV, a popular, free, and open source antivirus for Mac (my review of it here), is not allowed to use the Sentry program, which scans incoming and created files as they are written to the hard drive, if downloaded from the Mac App Store. If you want that feature, you must download the full version from the ClamXAV website. We can expect to see more of this in the future. Many developers hope to see looser restrictions and guidelines for sandboxing in the future, fearing potential lost revenue in the Mac App Store (for both them and Apple), as well as less powerful apps available. WHAT ABOUT APPS NOT AVAILABLE IN THE MAC APP STORE? There are still many apps not sold or available in the Mac App Store. Tools like Firefox, Google Chrome, Microsoft Office, Steam, Onyx, and more still publish their products outside of the Mac App Store for various reasons. These programs will not be directly affected by the rules of sandboxing because the rules don’t apply to them. Apps sold in the Mac App Store that use these apps may see restrictions, such as the previously mentioned MoneyWorks example, but apps sold outside of the store should still function as they have. Sandboxing will make apps more secure and most users should not notice many differences before the sandboxing implementation and after it. Developers will have to implement some features in new ways to meet the new standards, or remove some features entirely, while power users may notice a change in their workflow. Whether Apple will ease these restrictions or not has yet to be seen. If you have any questions, comments, or suggestions about this or any other topic, leave a comment below or email me at easyosx@live.com You can also check me out on Facebook, Twitter, and YouTube by hitting the buttons on the top of your screen. And check out my Google Plus. Thanks!